It is estimated that we, as millennials, will have at least 5 different careers in our lifetimes and many more jobs. So how can we even begin to prepare for a future that will no doubt be more mobile, autonomous and machine-driven than today? It’s not driving for Uber or Instacart, or generally participating in the pseudo-freedom of the gig economy. Sure, I’m a huge fan of the best side hustles, but only if they help you make money to invest AND new skills. I have a real problem with the gig economy. Driving for Uber won’t turn into a lifetime career, especially since they are actively investing hundreds of millions of dollars in building self-driving cars. While driving for Uber, or doing any other side gig, it’s essential to be developing skills and not only offering a commodity service (like driving people around). How do you future-proof yourself and build the skills necessary to adapt in a rapidly changing world? 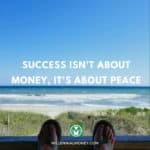 Money, success and building wealth are almost always skills driven. Personally, I’ve been able to maximize my value specifically by learning in-demand skills (like the one’s highlighted below!). According to the Pew Research Center future jobs will specifically require enhanced social and analytical skills. Here are the specific essential skills that I think are going to be essential to survive and thrive in the future and where you can learn them. 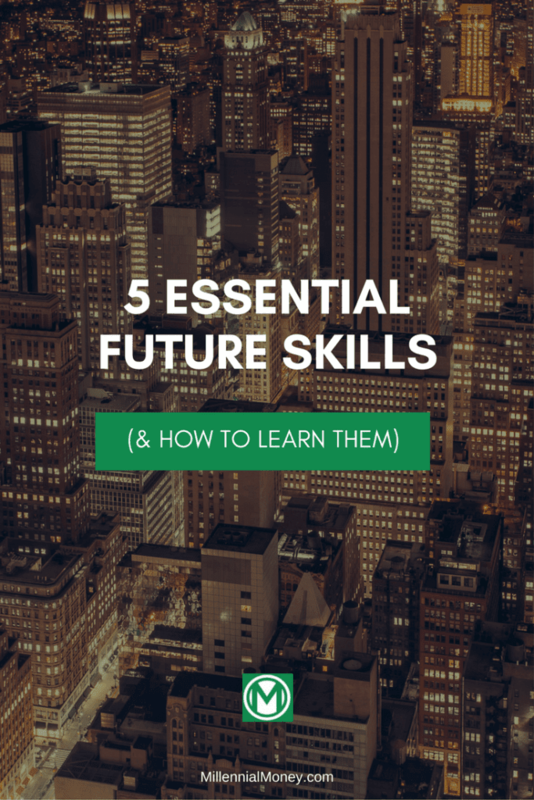 I personally try to learn 3 new future-proof skills every quarter. So far this year I’ve learned how to master iMovie (by editing the upcoming Millennial Money Course), took an online corporate accounting class, and studied how to do amazing radio interviews. It’s so easy to learn almost anything for free online if you simply dedicate a couple hours of week to anything. Some of the best free, or inexpensive, online courses can be found at Coursera, Udemy, EdX, Udacity, Lynda, Khan Academy, and Codecademy. I have personally taken over 20 courses from these platforms over the past 5 years and loved each of them. If you want to get ahead, diversifying and building new skills are essential. 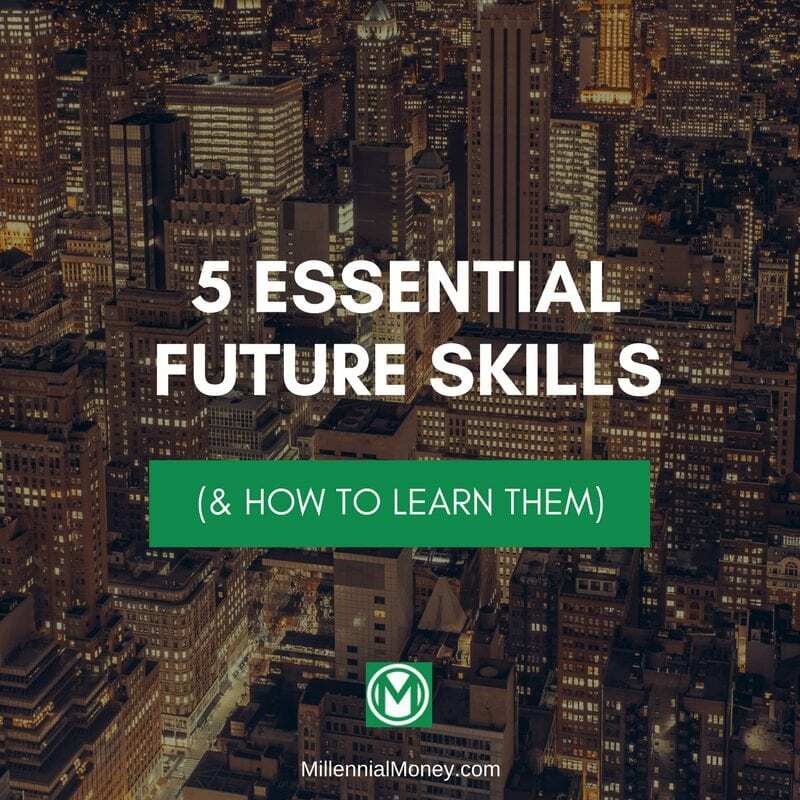 While I can’t predict the future, these five skills will be in-demand and can help you make more money. Future-proof reason: Selling helps you get what you want – whether it’s a deal, a new job, or simply getting someone to agree with you. In an increasingly personalization driven future, those who can sell ideas, products, and themselves will have a strategic advantage and make more money. A vast majority of the world’s transactions and conversations happen between people. And despite the obvious increasing pace of technological innovation, engaging person to person will still be the dominant form of communication. This is why selling, yes selling, is an insanely valuable skill that I recommend study and work to get better at. Seriously, in a world where competition just keeps getting more intense, people who can sell both themselves and the value of products will be in high demand. 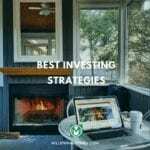 You can actually learn how to sell well pretty quickly – there is a ton of amazing and information you can turn into habits easily. As Daniel Pink highlights in his wonderful book To Sell Is Human , we are selling in almost everything we do. To sell is to convince others of the value you, your idea or your product will bring to someone. In the future, it will only be more challenging to sell, as the noise, information, and products available are only increasing. In the future people will also increasingly function like brands and it will be highly likely that you will want, or need, to side hustle and win your own clients. Whether or not you plan to build a consulting business or become an entrepreneur, learning how to sell will future-proof you in a lot of ways. For an awesome guide on selling check out The Irresistible Consultant’s Guide to Winning Clients . Check out this next level TED talk from Daniel Pink. Future-proof reason: Getting someone’s attention online will only continue get more difficult and those people who can reach and engage other’s online are, and will be, in high demand. What I love about digital marketing is that it’s both right brain and left brain. I’m also really competitive and love that I can use digital data to determine how well my campaigns are doing. Both marketing or the internet aren’t going anywhere, so at least learning the basics of this field can give you a huge leg up in a job interview or if you’re an entrepreneur you can market your own product. Too many early entrepreneurs try to outsource (and spend big money) on their marketing. Learning how to do it yourself, even if you don’t do it forever, will make you a more strategic thinker. I’m a bit biased on this one because digital marketing has been one of the key drivers in my own wealth building and side hustle journey, but I strongly believe it’s an essential skill set to develop for the future. You can learn the basics quickly, the skills are in demand, and the starting salary for an entry-level digital marketing job is between $40,000 – $55,000 in most cities. Here’s an awesome free resource to figure out average salaries in the creative and marketing industries. Another great thing about digital marketing is that you don’t need a degree in it to get a job. You just need to learn it, get certified for free, and prove you can do it. A vast majority of the best digital marketers I know are self-taught and a lot of them now make six figures. Google Adwords: This is the platform you use to run ads on Google. It’s built on an open marketing bidding system, meaning there is a live-auction every time someone searches for something on Google. It’s an insanely lucrative business for Google and you can learn the foundations of digital marketing in a few hours on Youtube for free like I did. Here is where you should start learning Google Adwords and as an added bonus, you use these same study guides to prepare for the Free Google Adwords certification exam. Once you get certified, you can add the certification to your resume and LinkedIn profile. It’s very attractive to potential employers. I recently mentored a guy in Chicago who knew nothing about digital marketing. In 60 days I got him a $45,000 job at a digital agency as a PPC specialist. Here is the first video from Google in the YouTube Google Adwords course so you can get started. Facebook Advertising: Facebook’s advertising platform is terrible, but it’s an effective digital marketing platform and worth learning in addition to Google. It’s also easier to learn than Google Adwords. The key with Facebook ads, is you need to have really strong images or videos and build effective targeting models. You can learn how to do Facebook advertising on YouTube or through Facebook’s free tutorials. Some of my other favorite digital marketing resources are search engine land and Neil Patel. If you want to take a full digital marketing course to learn all of the basics, check out this digital marketing marketing course on Udemy (currently only $10). If you want the best – this online digital marketing course from Wharton is next level for about $500. Future-proof reason: Uh, this should be pretty obvious. Code runs the world. Time requirement: 8-10 hours per week for 6 months. A little bit of a commitment, but you can learn the basics quickly and expand your skills when you like. There are many bootcamps where you can learn how to code in 30 days, which are also great options if you want to make the full leap into a new lucrative career. Coding is more like a mindset and will change the way you look at the world. It’s no surprise that being able to code will give you an advantage in the future. Even if you have no plans to become a coder, learning how to code will teach you so many things about how the world today works and how the future is literally being built. Every app, website, car, or piece of hardware that you use is powered by code. I started learning how to code with I was 15 and built a website using HTML shortly thereafter and then over the years I’ve learned a few programming languages. Once you learn one, it’s significantly easier to learn the second one. While there are tons of coding languages, I recommend learning Java, SQL, Python, and Ruby. A great place to start for free is Codecademy, where you can tart feeling it out and go at your own pace. I love Codecademy and still use it frequently – it’s where I learned Ruby. If you want to learn Java and the fundamentals of programming, here is an awesome sequence of 5 Java classes offered online by Duke. Future-proof reason: We no longer have to guess why people buy or engage, since there is data tracking us all the time. But the data can be overwhelming and is only useful when you can extract insights and then act on them. Data and analytics will only become more prevalent in the future, as more of our actions are tracked. Learning how to use data to power your decisions will be essential for most roles in the future. Time requirement: You can learn Google Analytics in 1-2 hours per week for 8 weeks. Business Analytics takes more time and it’s worth taking a course. If you can master all three, you will not only be a more valuable job candidate, but you can have a measurable impact in most business environments, companies, or even use the info to launch and optimize your own business. I do this using a mixture of business intelligence dashboards and my OG day one homie Google Analytics! We go way back and I spend literally everyday using Google Analytics. If you don’t know how to use Google Analytics, you should check it out. Like Google Adwords you can learn how to use it for free online at the Google Analytics Academy. To go deeper on business analytics, check out this business analytics Coursera course. Here is the best practical book that I’ve read on how to actually understand business analytics – Data Science for Business: What You Need to Know about Data Mining and Data-Analytic Thinking . Here’s a great intro video on business analytics. Future-proof reason: We are all brands. Brand embody values. Embrace, amplify, and master it. Time requirement: 1-2 hour per week for 8 weeks, then a lifetime of refining ? We have fully entered an image and influencer driven world. The people who both create and curate content will thrive in the future, since people are looking for someone they trust to filter the infinite amount of information now available online. This is why everyone needs a blog and here’s how to launch one. At the intersection of image and influencer, are design and branding. As humans we almost immediately (in less than a second) form opinions of people and products upon encountering them. Branding is the process of design and messaging, to help you make the most of that opportunity. Branding creates a feeling, an emotional response that is created by both art and science (picking up any patterns with these future-proof skills?). You can actually learn the science behind branding, which include human perceptions of color, angles, and even fonts. Here is the best online course I’ve seen on the topic of personal branding (only $10). Here’s a cheesy but clear video on what is branding? The world moves insanely fast and will only continue to increase it’s pace. We as humans, with our million year old brains, can’t keep up. We are anxious, overworked, tired, and overstimulated. Success in the future will be determined as equally by your ability to engage and as it will to disengage. Simple 20 minute mediation, which I started two years ago, has had a profound impact on my life. I strongly recommend making it you own daily habit. I use the website Calm.com and the Headspace app regularly. What did I miss? Are you future-proofed? I’m doing pretty well! 🙂 I have at least some skills in the first 4 you mentioned above! My education is in statistics and mathematics, and I’ve learned how to code and perform analytics. In my free time, I’ve been working on my communication and digital marketing through my blog and reading. How do you think I’m doing? This is an extremely valuable post, Grant! Thanks for putting this together. I added each of the online classes you recommended to my to-do list. I’ve personally used Lynda to expand my coding skills and learn a little about SEO. To be honest, I think your SEO guide is better than anything I’ve watched on Lynda. I’m about half way through your guide and target completing it by the end of the month! Thanks! I am thinking about turning the SEO guide into a course. Here I was thinking that I really needed to get serious about learning digital marketing, and along came this article. Thank you so, so much! Adwords, Analytics and Facebook ads here I come! Awesome article, Grant! I definitely think that skills in AI/machine learning are going to be huge in the coming 10-50 years. I think you pretty much cover that in coding, But I’m sure that eventually machines will be building the things that humans currently have to code. They’re already reading through legal documents and tax code to provide advice. There’s also going to be an enormous amount of job less, but the skills learned in AI should hedge against that. Thanks for writing! Love that everything had links to go learn and gain some education from. Almost everything (minus coding) you have on your list has to do with running a blog. Since we started 8 months ago we have self-taught ourselves almost everything. We agree that these are going to be very important skills within the next couple of decades. Excited for our journey in running our own online business. Thanks! I agree that blogging is a great way to learn and use most of these skills. Thanks for the link to Calm.com, on the Bonus Link: Meditation. I was most interested in learning more and different techniques and perspectives about meditation. Also, hope to learn about the other neat stuff you talk about! Looks like I chose the right career then. Sales and Marketing Digital Marketer, I think it has helped me a lot in creating my blog. It has only be live for a couple of weeks but I have done my best to transfer my corporate career knowledge into my side hustle. Need to improve my coding skills though. I can fumble my way around but it is trial and error stuff. I like the paid version of Headspace. Try it out for a month and see. It’s worth it in my opinion. Thanks Colin. All I can say is thank you! This post is a treasure trove of information. I just started using google analytics and Facebook advertising. (My wife and I started a photography business). I felt overwhelmed by it all, but this helps to know where to look. Thanks again! I’m glad you found it helpful Ian. Your photography is beautiful. This was a great article, Grant. I work for myself and spend a lot of time in cafes. I constantly see people flowing in and out doing all of the above skills (other than meditation at the cafe!) for their jobs. The point is that these are skills actually get paid. For sure. The two that pay the most, in my humble opinion, are coding and sales (marketing). You know what else is pretty cool? All of these skills are pretty fun to learn and satisfying to deploy. I’ve done a bit of all of them, though my day job is full-time investor. Just found your website, and looking forward to reading more. Great article as per knowledge going forward ill do this in future.